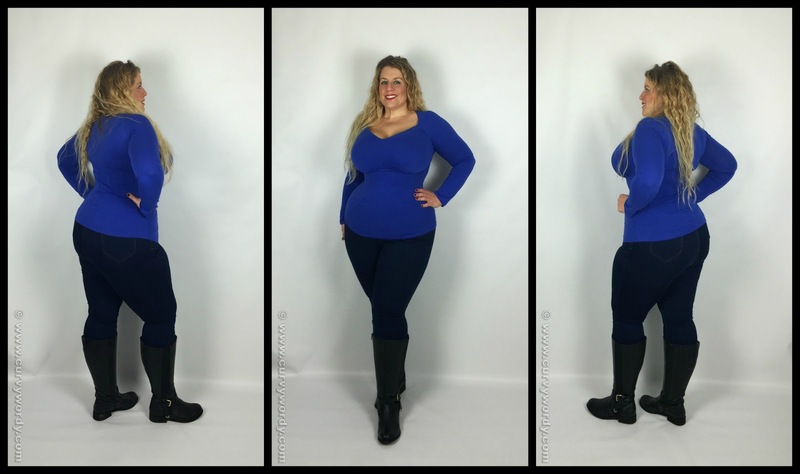 Simply Be Extra Curvy Plus Boots – Do You Get What You Pay For? I have always had wide calves. I inherited my dad’s thick rugby player legs and I have always had difficulty getting a decent fit in any kind of trousers or jeans. 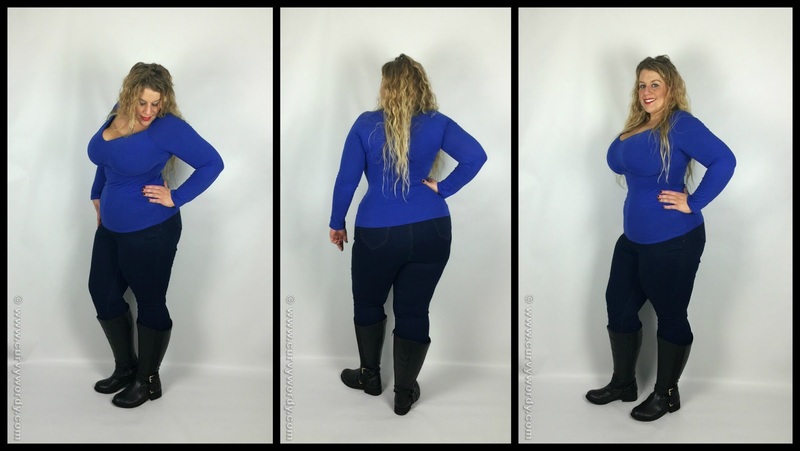 It doesn’t help that I have a 19″ difference between my waist and hips (currently at 32″ and 51″ respectively) but my thighs are also pretty chunky and don’t like to be contained by fabrics, especially those of the non-stretch kind. My calves haven’t usually caused an issue with leg wear garments, but they most certainly have with boots. Every autumn I eagerly go to shoe shops and make online orders in a bid to find the perfect knee high boots…but every time I am sorely let down by how the boots fit me in the calf. They simply don’t! I have tried all the usual suspects, including Evans, Yours Clothing, and even Duo Boots, but none have given me a perfect fit. They have either not been wide enough in the calf, or the width of the foot area has been insufficient. I know, I know…I have a very awkward body! But I strive to find a decent fit in footwear as well as in clothing, so my search for perfect boots has been a long-lasting one. I was therefore super excited when Simply Be brought out a range of extra wide calf boots: the Extra Curvy Plus range. No, your eyes do not deceive you. There are no fewer than 10 different styles, all with calf widths to fit legs as stocky as mine. 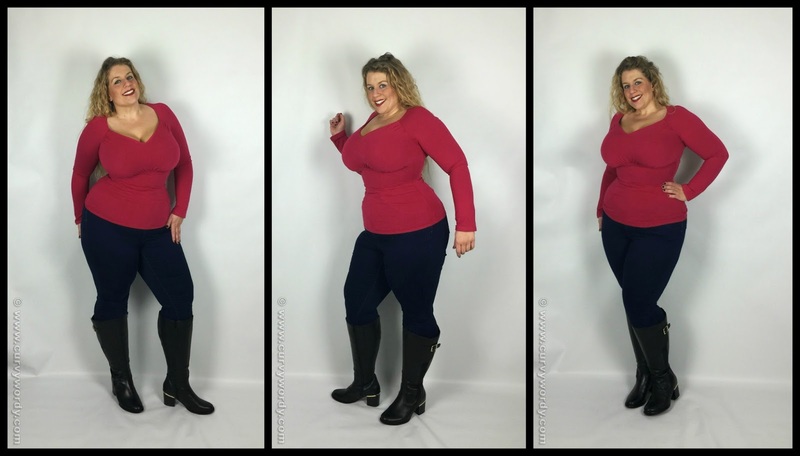 I checked the size guide and was over the moon – I could finally possess knee high boots that comfortably fitted my calves without being overstretched. My calves measure about 49cm (just over 19″), which puts me in the ‘Curvy Plus’ calf width range according to the size chart, but I have tried boots from this range before and they just didn’t fit. 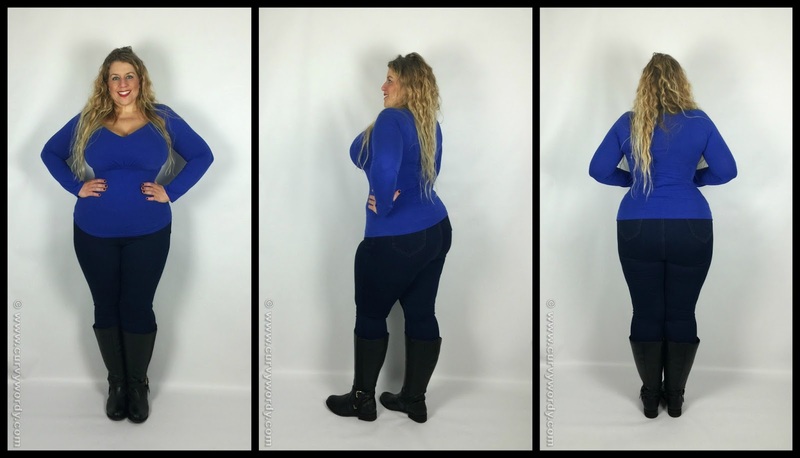 It’s always best to go a little bigger if you can to allow for jeans or leggings to be worn with the boots, so the Extra Curvy Plus fit looked ideal for me. I noticed that there was quite a variation in the prices, going from just £30.00 up to £89.00, and I wondered if there would be a huge quality difference between the cheaper boots and the more expensive options. I chatted about this with the lovely team at Simply Be, and we agreed that it would be interesting to road test them in order to make a fair comparison. They very kindly agreed to send me two pairs of boots for my mission, and I opted for the black Legroom Elastic Detail Boots E Fit Extra Curvy Plus Calf Width (£30.00, UK sizes 4-8 (also available in EEE fit here), and the black Legroom Leather Boot with Gold Detail Extra Curvy Plus Calf E Fit (£85.00, UK sizes 4-9 (also available in EEE fit here)). For reference, in the photos below I am wearing my BiuBiu Florence Tops (blue with with cheaper boots, and fuchsia with the more expensive ones) and my Evans Pear Ultra Stretch Skinny Jeans. So, let’s start with the bargain boots first of all. 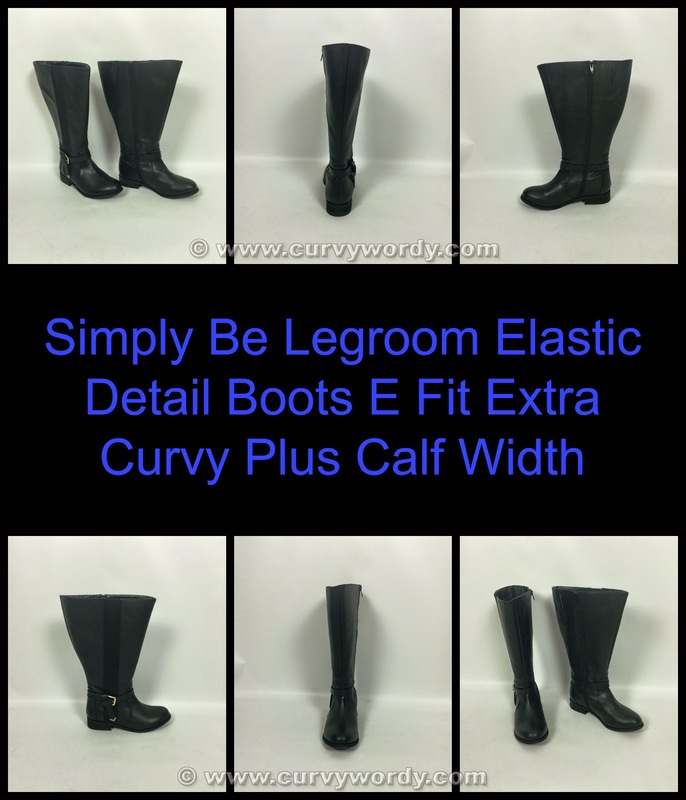 I opted for the Legroom Elastic Detail Boots E Fit Extra Curvy Plus Calf Width in a size 6 as I tend to size up in boots to allow for wearing them with thick socks. According to the size chart, these boots will fit calves up to 55.2cm (just under 22″) in diameter. Despite being priced at a meagre £30.00, these boots are actually great quality. No, they’re not real leather, but they are made from a decent ‘pleather’ that feels like it won’t fall apart on the first wear. The boots have a stretchy panel down the outside that allows for shapely legs and they fasten with a full length zip on the inside. As you can see from my photos, these boots are actually too wide for me at the tops, and at first I worried that this looked odd. I took some time when I was out and about to observe women in knee high boots and I found that many of them had this feature with their boots too and they looked absolutely fine! So, my worries were put to bed, and I continued with my review. The heel on these boots is minimal – only 2.8cm (1⅛“) – so they felt quite flat. This made them perfect for lots of walking and I found them very comfortable to wear. In autumn and winter I usually wear Skechers Tone Ups Boots, which have incredibly soft and bouncy soles, so these Legroom boots did take a bit of getting used to at first because the soles were much less forgiving, but I found adding a pair of memory foam insoles helped me transition more quickly. I like the buckle detail on the ankle, and it’s great that it can be adjusted tighter or looser to suit the wearer’s ankle width. A common complaint with wide fit and wide calf boots is that the ankles are too big; I must admit that I did find these somewhat on the baggy size but tightening the ankle buckle helped with this. I do think flat boots can sometimes have the look of wellies, but for me these boots avoid that thanks to their design features of the ankle buckle and the shaped toe. All in all these boots are superb value and are well worth every penny of their £30.00 price tag. Now, let’s move on to the pricier boots to see how they compare. 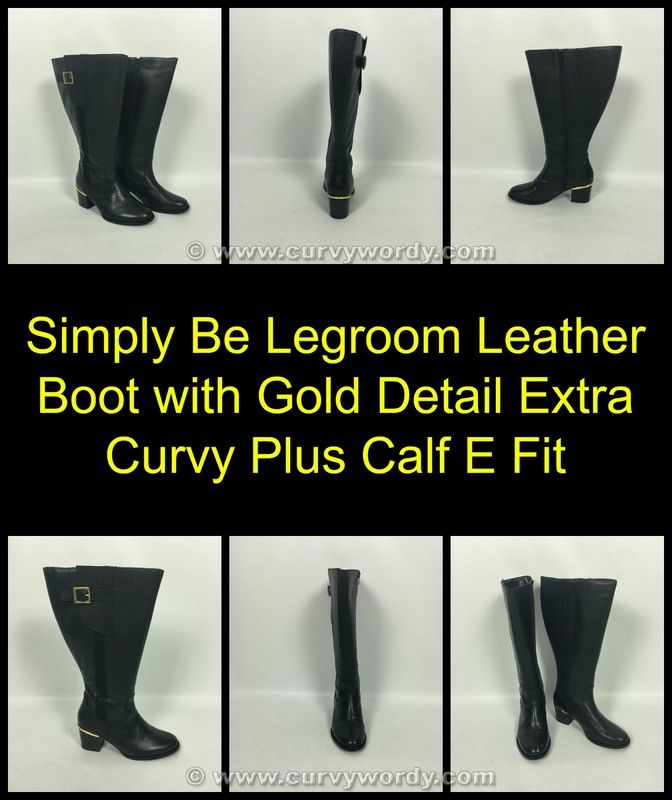 The Legroom Leather Boot with Gold Detail Extra Curvy Plus Calf E Fit are the second most expensive boots in the Extra Curvy Plus range. Once again, I opted for a size 6 to give me room to wear thick socks with the boots if wished. At £85.00, these boots are almost three times more expensive than the previous pair. They are made from a gorgeously soft and supple leather that smells amazing and looks fantastic. Like the cheaper boots, these have an elasticated panel on the outside to provide a good fit on the leg and they fasten on the inside with a full length zip. There is a buckle at the top of the leg, which is mostly there as a design feature, but it can be tightened to make the boots slightly more narrow at the top. I was interested to find that these boots are also wider at the top than I needed, but as I had already made myself comfortable with this aspect it wasn’t an issue for me. I was even beginning to feel kind of smug that I had boots that were bordering on being too big for me in the leg – fancy that!! The block heel is a key feature of these boots. It’s about 3.1cm (1¼”) in height and makes the boot look smarter and more sophisticated. The gold strip at the top of the heel is just gorgeous and really stands out from the black leather and heel of the boot. It matches perfectly with the gold of the buckle at the top, so great attention to detail has been paid to the design. The ankle on these boots is a snugger fit than the cheaper options, and this suited me very well. I don’t have small ankles by any means, but these boots have been cut to allow for a closer fit. This helps to make the leg look longer and slimmer, so if that’s something you are looking for in boots these are a good pair to try. Once again the sole of these boots is thinner than what I am more accustomed to but a memory foam insole helped them feel very comfortable more quickly. I also don’t often wear heels for walking so that felt a little unusual at first but as the heel isn’t very high it did not take me long at all to adjust. Both boots are absolutely lovely and are very comfortable to wear. The cheaper boots are undoubtedly a superb bargain and will be ideal for anyone on a budget looking for everyday boots. The more expensive boots are clearly in a higher league quality-wise, and their design is very beautiful and elegant. I therefore have to say that the £85.00 boots are my preferred option, but the £30.00 boots come a very close second place. Yes, you get what you pay for, but the bargain boots are good quality despite their low price tag. Do you struggle to find boots that fit your calves? Have you tried any from Simply Be before? Let me know by commenting below! I definitely prefer the look of the £85.00 Boots, sometimes I get mine from Evans, but mostly Simply Be, they have never let me down! Such a fab review and great to see Simply Be doing this kind of range! Oh, I feel your pain on this Jayney. I remember a time when I was in Evans trying on boots and I felt so embarrassed that I couldn't do up the zip because the calves weren't big enough for me. Thank goodness for Simply Be boots! Aww…….You look cute and comfortable. Was wondering if you ever tried those leather front with stretchy fabric back boots that stretch to fit your leg. The fit is snug but the styles are usually quite nice. 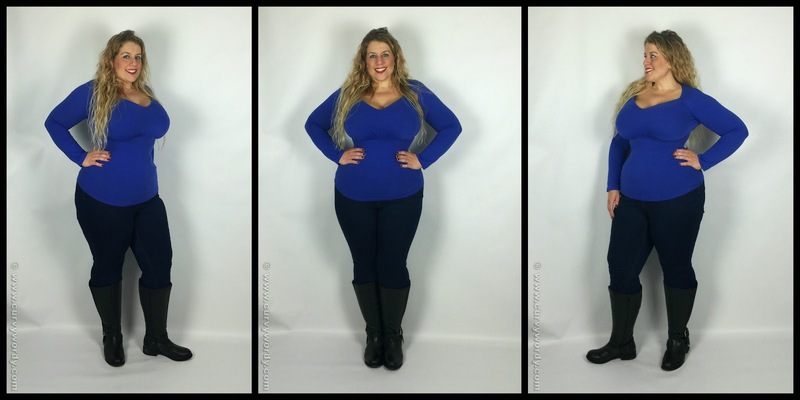 Yes – wouldn't it be wonderful if the Extra Curvy Plus range was even bigger?? I'd love some wedge heeled boots with a platform as well. Nothing mega, but just enough to give me height and cushion the sole. I live in Victoria BC and shop at Aldo for my boots. If you buy the all leather ones they can stretch the calf for you. It can take a little bit as they are very careful on how they do it so that they don't ruin the boots. In the end they fit like a glove and you feel like you have a custom pair of boots. I've done this a few times now and have never had a bad experience and what makes it even better is that it's a free service.